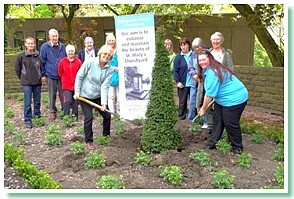 On Wednesday 7th May 2013 the Friends of St Mary’s Churchyard helped to plant two columnar yew trees in the newly designed and planted bed behind the War memorial at the top of the steps in the churchyard. The group was started in July 2013 to help enhance and protect the closed churchyard, which is maintained by Erewash Borough Council. Memorial stones for the interred ashes of loved ones are frequently visited by relatives, but some are overgrown and The Friends have started edging and tidying around the area. As most of you will know, Narcissi were planted in the Autumn and hopefully the snowdrops planted “in the green” will provide a good show next Spring. The Cantelupe Kids Club have also helped to improve the appearance of the churchyard by planting bulbs and flower borders. The Youth Club too are planting a flower bed next to the Centre. Some of the memorials have already been cleared of ivy and areas have been reseeded with grass by the council. Native trees will be planted to encourage wild life. A working party will meet the last Saturday of each month from 10am-12noon. The Group has received a generous £300 grant from County Councillor, Glennice Birkin’s Members’ Community Fund for further improvement work to the churchyard and memorial garden. Do take time to have a wander round and appreciate the improvements! 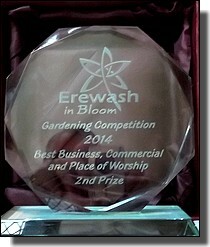 Several weeks ago a letter from Erewash Borough Council arrived informing me that Friends of St Mary’s Churchyard had won an award in the Business, Commercial and Places of Worship category of ‘Ilkeston in Bloom’. We were to attend the presentation on the afternoon of 10th October at Morley Hayes. Susan Bell and myself went along. We were photographed on our way in and apparently the photos will be part of a display of Erewash in Bloom in the Town Hall eventually. The Mayor was there, to make the presentations with the help of the Green Space and Street Scene Team from the Council. We were awarded joint second in our category and judging by the other entries we will have to up our game considerably to win first place…… Who knows? Well done to all who have helped clear graves and plaques, helped plant narcissi and snowdrops, deadheaded roses and generally helped in the care of our churchyard. The Youth Club and Playgroup deserve a mention for their planting and Cantelupe Kids’ Club also gained second place in their category. Their beautiful garden no doubt helped us to win our second place too. Congratulations to all those green fingered people. Ilkeston was also awarded a Gold medal for their entry into East Midlands in Bloom. This was their first Gold and the efforts of The Friends of St Mary’s Churchyard were noted by the judges on the day they visited the Market Place. We can all say we contributed to Pride in Erewash. A special thanks should go to Jamie and his council gardening team in the Churchyard. They have been helpful, planting the area by the steps, clearing particularly difficult overgrown memorials and encouraged us with helpful discussions.